Evidence of a former convent? “There is a tradition" said historian John Potter Briscoe, writing in 1877**, "of some pious nuns having lived at Collingham in the 7th century, who, in order to make themselves repulsive to the pirate Danes, and so preserve their chastity, cut off their noses and lips. “Several historians have adopted this quaint tradition, and it has been believed that the nunnery inhabited by these devotes was destroyed by the Danes, along with the Abbeys at Crowland, Ely, and Peterborough. “Others maintain that the Collingham where the chaste women lived, was a town in Scotland, and their nunnery was a cell to the Abbey of Durham. “It must, however, be added that in 1863 some workmen discovered the foundations of a very large building upon the very spot which had been indicated for generations as the site of the convent of the ‘bloody nuns of Collingham’”. This page was added by John Farjeon on 04/02/2013. John do you have any references or documents concerning the foundations found in 1863? Regards. 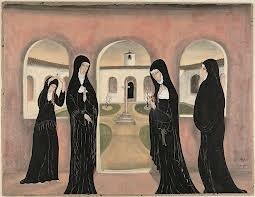 Unfortunately I don't have any other pointers about this supposed convent, only what Potter Briscoe says. I thought the tradition/story was interesting, so thought I'd submit it, but it didn't sound too likely to me. Sorry.